A protected tree was identified as being at risk from the construction of the Northern Line Extension ventilation Shaft site at Kennington Green . In addition the Ailanthus altissima (or Tree of Heaven) had particular value to local residents providing screening to their properties and ecological interest. In order to fully assess the likely impacts on the tree and the potential for pollarding over complete removal, Digital Engineering (BIM) modelling was used to fully understand the extent of the proposed works. Ground penetrating radar was used to undertake a tree root survey, to determine the spread of the roots. This information was then used by an arboriculturalist to make a recommendation on the viability of the tree, once the excavation works had been completed. 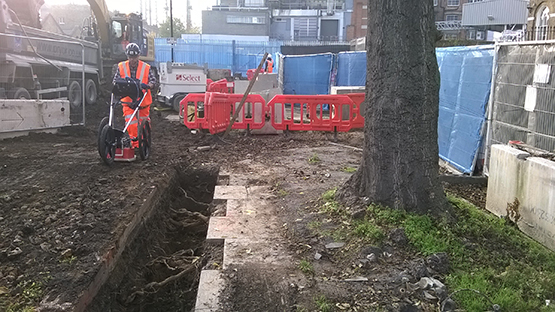 The ground penetrating radar survey showed the root spread to be predominantly on the side of the works, meaning that the tree would become unstable, even if pollarding was undertaken. As a result the tree was removed. However the extent of the investigation and a high level of engagement reassured residents that every option had been explored. Further to discussions with the residents and the local Tree Officers four semi-mature pear trees in planters were positioned on site to provide screening as temporary mitigation during the five year construction programme, until the final landscaping design is implemented. The trees in the planters will then either be incorporated into the landscape design or planted as street trees.